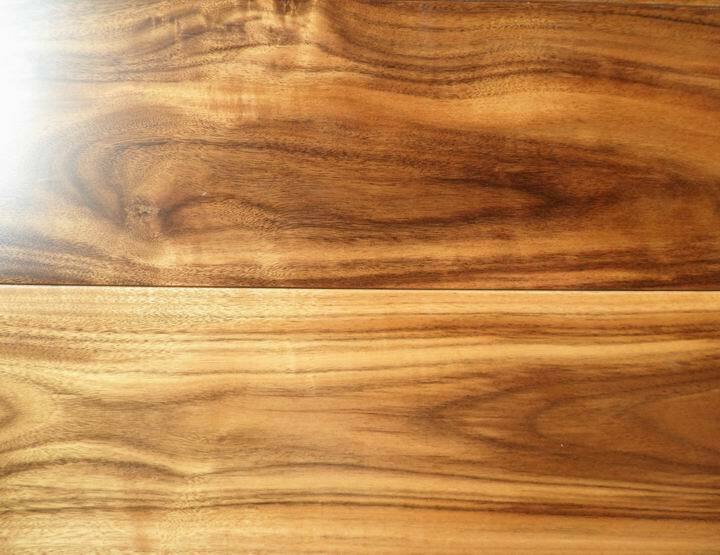 Acacia Flooring or Asian walnut hardwood flooring is becoming increasingly popular in recently years with its unique colors and properties.It's one of best hardwood species instead of American walnut from Asia. 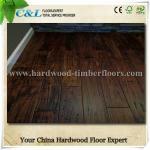 AB Grade Asian walnut hardwood flooring is similar to American walnut flooring in appearance if stained with little dark colors . Acacia wood is to some extent better than American walnut in hardness and durability,whose hardness with more than 2000psi comparing with 1010psi of American walnut wood . 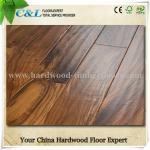 The commercial name of Asian Walnut is called acacia(China Origin),The acacia flooring can be Golden,Yellow,Red,Dark brown etc.In the past few years, many china wood flooring factories has huge stock of this wood for exporting,or even we can say it is NO.1 hardwood flooring item for exporting to North America Market! 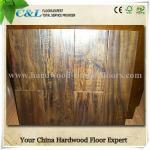 C&L hardwood flooring has a branch factory in South China where is close to the rich Asian walnut wood source,therefore we could guarantee the long term stable supply of this popular hardwood flooring materials. 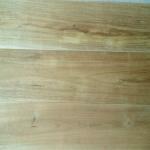 Acacia is a small tree characterized with many sub-branches on trunk,so after the timber been cutting off,the wood is much more knotty than other wood.Due to this character,most of acacia flooring manufactures supply ABC Grade acacia hardwood flooring only in Bulk quantities.Pure A grade solid acacia wood have to be selected from bulk ABC garde timber boards,therefore A Grade Asian Walnut is more costive than normal AB /ABC Grade.On the other hand, acacia hand-scraped hardwood flooring are commonly seen on Acacia due the wood natural characters. 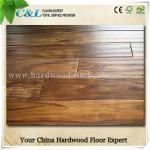 C&L hardwood offer also engineered acacia hardwood timber flooring to the customers who has low budget but want the same flooring effect to solid acacia wood. C&L hardwood supply acacia flooring with factory finish(Germany Treffert Wearing Resistant Coating) on surface,with 8 layers primer coatings & 4 layer top UV coating layers,the hardwood floor board surface scratch & dent resistance will be greatly enhanced.So C&L hardwood Asian walnut acacia flooring comes with 7 years coating wear though warranties & 25 years residential use warranties.Surface damage like scratch,dent,dirt stains etc could be removed by resanding and refinish by professional workers.Under proper maintenance,you are expecting to enjoy the solid asian walnut flooring in life time!